Bring guests without estate admission to Antler Hill Village & Winery after 5:00 p.m. (guests do not have access to Biltmore House & Gardens and must accompany passholders in the same vehicle). Renew your pass online or call 800-413-9787 to renew. You can renew your pass online up to 6 months before or 30 days after the expiration date. *Plus tax. Savings based on regularly priced adult daytime admission. Restrictions may apply. If your pass expired more than 30 days ago, please call us at 800-413-9787 for assistance. Never be without your Passholder benefits. 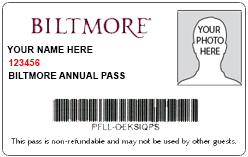 Bring your paper pass to the Biltmore Reception & Ticketing Sales Center, or to any guest services location on Biltmore, and we’ll replace it with a free Passholder Photo ID card.